When is the most effective moment to show your visitors a call to action?. Whether they have just had an “Ah-Ha!” moment after watching your video or seeing a really interesting product with lots of social proof, it’s important to harness that unique moment by showing a Call to Action. For the last several months in the Proof Marketing Laboratory, we’ve been testing different forms of call to actions. Needless to say, this stuff is powerful. Today, we release it to the world. We’ve given you full control to customize Conversion Cards to your business. Write a compelling headline and call to action that gets your visitors to click. You can even trigger the button to open Intercom for visitors to chat you immediately! The possibilities are endless with Conversion Cards. Today, all Proof Business plans and above have access to the power of Conversion Cards. 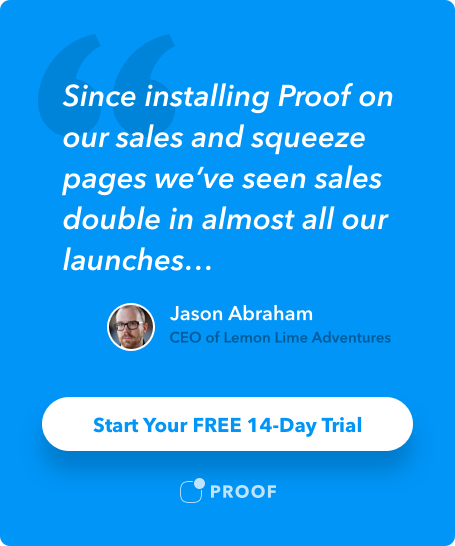 Setup takes less than 5 minutes, so jump into your Proof campaigns now and supercharge your Proof with calls to action! Here’s to higher conversions, my friends!